Anna M. Hand (Anna Marie Fox) was living at 1212 Cherry St. in Philadelphia at the time of her death. Hand: Edward Hand portrait donated 1875 by Anna M. (Fox) Hand to the Historical Society of Philadelphia. This is excerpted from: History of the portrait collection, Independence National Historical Park By Doris Devine Fanelli, Karie Diethorn. General Edward Hand was the grandfather-in-law of Anna Marie Fox Hand. 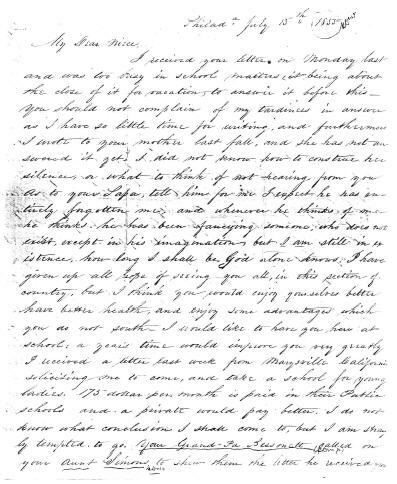 Hand: Letter written by Anna Marie (Fox) Hand in Philadelphia to Catharine Ann (Bessonett) Fox in Natchez, Mississippi, November 7, 1853. Click the thumbnail image to open the PDF in a new window. 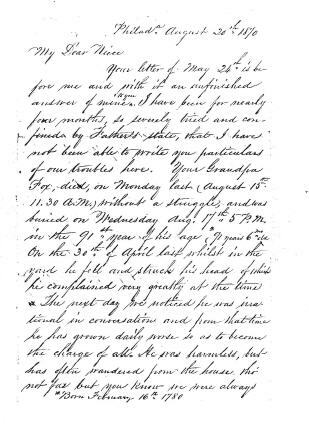 This letter describes the death and funeral of Samuel Fox in Philadelphia. 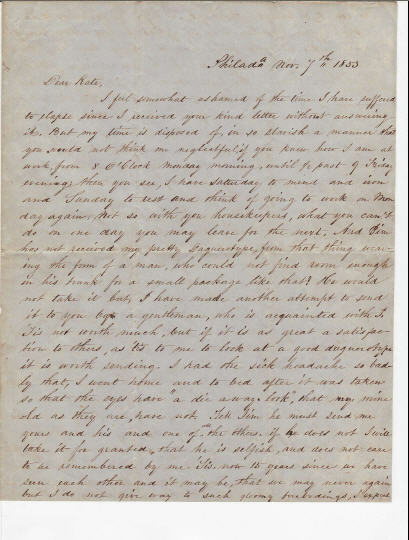 The original of this letter is now at Louisiana State University, Baton Rouge, Louisiana, Waddill Family Papers (Mss. 4578), Louisiana and Lower Mississippi Valley Collection, Special Collections, Hill Memorial Library, since 1997. 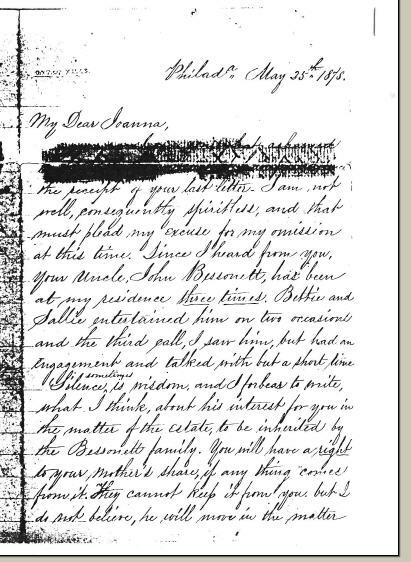 The original of this letter is now at Louisiana State University, Baton Rouge, Louisiana, Waddill Family Papers (Mss. 4578), Louisiana and Lower Mississippi Valley Collection, Special Collections, Hill Memorial Library, since 1997. 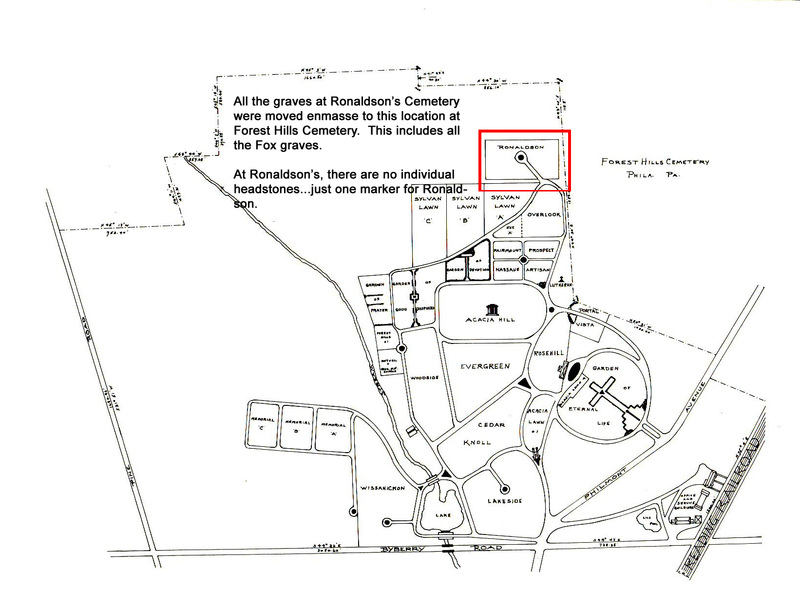 Fox: Map of Forest Hill Cemetery in Philadelphia showing the location of all the graves from Rondalson's Cemetery (a.k.a. Philadelphia Cemetery). This is the location of all the Fox graves that were formerly in Ronaldson's. No headstones exist...only one marker for Rondalson.